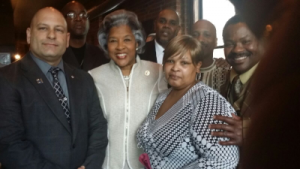 “Where A Bus Is Nothing Without Us” went to last night in Columbus, Ohio for U.S. Rep Joyce Beatty. I was there to talk with her and deliver a message from the international and also as a rep of the Ohio/Michigan State Conference and I conveyed the importance of protecting transit jobs, to increase transit funding, and to eliminate privatization. Pic from left to right are Ronald L Dreyfus Jr. – President Twu Local 208 and a Rep of the Ohio/Mich State Conference, Olando Epps-1st VP 208 and a Rep for the Ohio/Mich State Conference, US Rep Joyce Beatty, Lyntel Cannon 208 Recording Sec, Marcia Woods-Johnson-208 Exec Board, Joseph Lindsey-2nd VP 208, Mike Zimmerman-208 Exec Board, not pictured Henry Cade III-208 Exec Board.